On April 14, 1554, commissioners from the papal party (including Edmund Bonner and Stephen Gardiner) began an examination of Latimer, Ridley, and Cranmer. Latimer, hardly able to sustain a debate at his age, responded to the council in writing. He argued that the doctrines of the real presence of Christ in the mass, transubstantiation, and the propitiatory merit of the mass were unbiblical. The commissioners tried to demonstrate that Latimer didn't share the same faith as eminent Fathers, to which Latimer replied, "I am of their faith when they say well... I have said, when they say well, and bring Scripture for them, I am of their faith; and further Augustine requireth not to be believed." 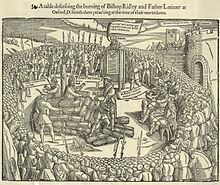 The deaths of Latimer, Ridley and later Cranmer – now known as the Oxford Martyrs – are commemorated in Oxford by the Victorian Martyrs' Memorial which is located near the actual execution site which is marked by a cross in Broad Street (then the ditch outside the city's North Gate).